Law Office of Sarah Dinsmore Riggs, PLLC offers quality legal services at a competitive rate. 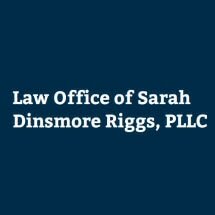 As the sole attorney at Law Office of Sarah Dinsmore Riggs, PLLC, Attorney Riggs provides each client with personal and knowledgeable representation. As both a wife and a mother, Attorney Riggs understands the importance of her client's family law issues and she has the experience necessary to resolve those issues by way of mediation or litigation.